The Homebuilding & Renovating Show is the biggest homebuilding and renovating event in the UK and a hub of building and renovating expertise. Hear specialists talk about everything from plot finding to perfecting interiors, get personalised advice on your project and discover brands showcasing a vast range of products. 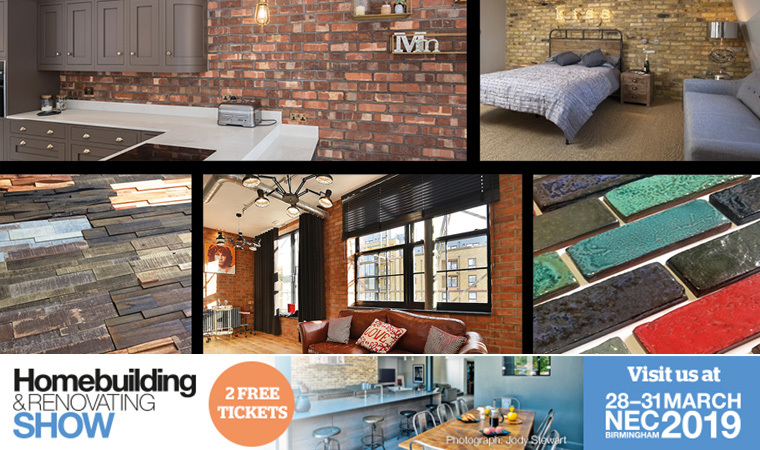 Visit Stand E204, where we will be showcasing our new range of Brick Tiles for authentic feature walls.This will include the latest additions to the range, such as the premium Glazed Brick Tiles, with an artisan finish, plus a selection of new wooden Feature Wall Panels. A large selection of our traditional handmade, wirecut and pressed bricks suitable for self build, renovation and extension will also be on display. Our expert team will be on hand at the show to discuss brick matching, review project plans and offer samples and advice for internal and external applications. Don’t miss our Specification Manager, Ruth Hughes, delivering a Masterclass on ‘How to choose the right brick for your restoration, renovation or new build project’ on Saturday 30th March at 10.30am.